Taegerwilen, Switzerland, March 15, 2017 - The global market for laser systems for materials processing increased by 6.8% in 2016 and reached the new record volume of $ 12.6 billion. The increase was mainly due to China where demand surged by nearly 20%. The manufacturing industry in the country continued to invest heavily into laser-based equipment despite the deteriorated economic environment. The demand for laser systems in Europe and North America trended sideward last year. Japan added a positive contribution to the global laser systems market due to the increased value of the Japanese currency. On the supply side, laser system manufacturers in China benefited strongly from the surging demand in their country, while imports even declined. Laser macro processing systems, used for cutting, welding, marking, and additive manufacturing, account for 75% of the total market volume of $ 12.6 billion. The market segment increased by 4.5% last year and outpaced the machine tool market which contracted by 3% according to VDW (German Machine Tool Manufacturers Association). Still, the automotive industry is a major driver with substantial investments into high-power laser welding and cutting equipment. 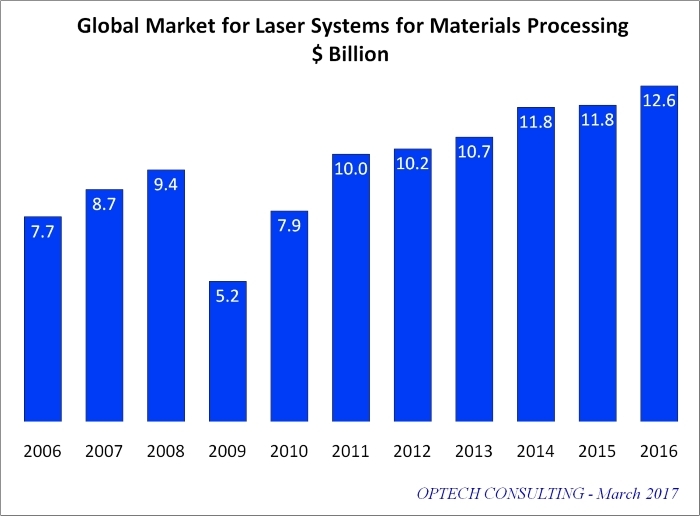 The market for laser systems for microelectronics processing accounts for a 25% share of the total of $ 12.6 billion. The segment expanded by 15% in 2016 mainly due to the increased use of laser processes for the manufacturing of mobile electronic devices and their components such as displays and semiconductors. high-power cutting and welding, and their major applications now are marking and the processing of non-metals. In addition, the use of CO2 lasers for the generation of EUV (extreme ultraviolet) for microlithography increasingly contributes to the CO2 laser market. Excimer lasers are mainly used for microlithography and in flat panel display manufacturing. Their market volume increased strongly in 2016 due to rising demand for flat panel display annealing. Optech Consulting, Taegerwilen, Switzerland specializes in market research and consulting for the laser and photonics industry. 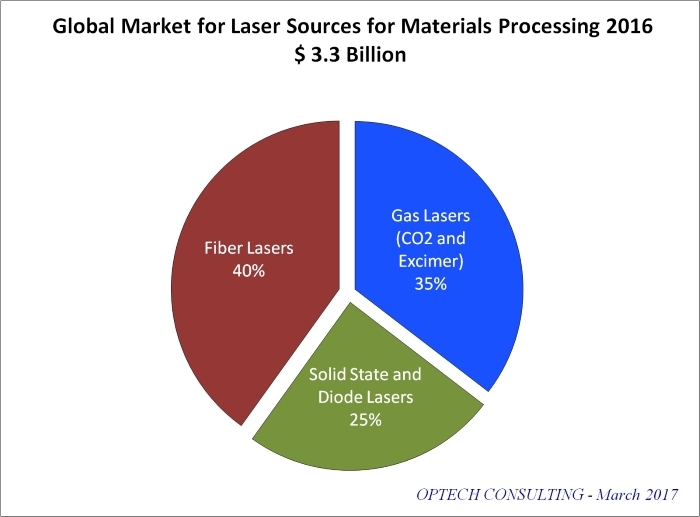 Pie chart: Global Market for Laser Sources for Materials Processing 2016 (Total: $ 3.3 Billion).